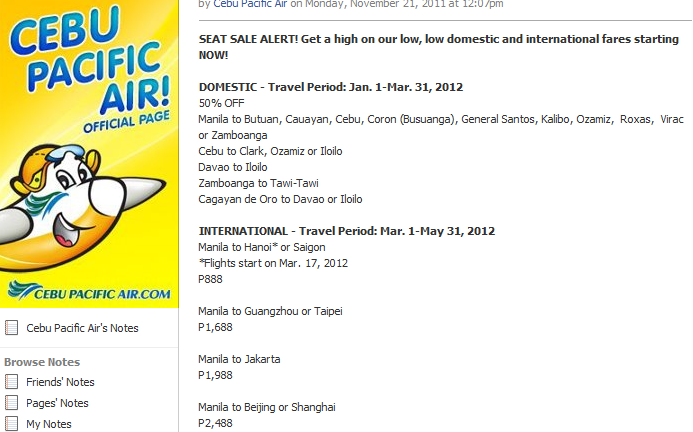 Cebu Pacific once again announces its latest Seat Sale for selected domestic and international flights. Domestic trips have been slashed down to 50% the original base fare with travel period inclusive of January 1 to March 31, 2012. This includes flights from Manila, Cebu, Davao, Zamboanga and Cagayan de Oro. International flights start at Php 888 with travels to Hanoi, Saigon, Guangzhou, Taipei, Jakarta, Beijing and Shanghai. The travel period of which is on March 1 to May 31, 2012. Check details below. 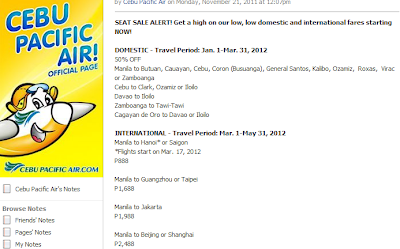 Book your tickets now, Seat Sale is up until November 24, 2011 only. @Gatesben, Thanks for dropping by.